Mike Aviles had to be restrained by first base coach Alex Ochoa after being called out on strikes by home plate umpire Dan Bellino on Thursday. ST. PETERSBURG, Fla. - The Red Sox seem prepared to play their first interleague series of the season starting Friday night, when they take on the equally disappointing Phillies, a high-payroll team that also has suffered numerous injuries and setbacks. They are teams who have mirrored each another, but the Red Sox, who have won six of seven after a 5-3 victory over Tampa Bay Thursday night, will first be facing Cole Hamels, which means Boston should hide rookie third baseman Will Middlebrooks. Just kidding, of course, but Hamels served a five-game suspension recently after admitting he drilled Bryce Harper of the Nationals because he is a rookie. 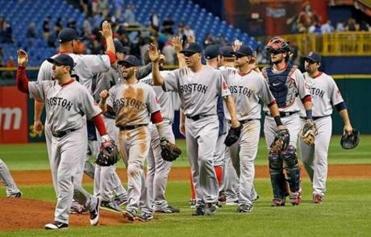 The Red Sox (18-20) left here with a split, but frustrated with the umpiring. That frustration got Mike Aviles ejected Thursday night, while Dustin Pedroia was upset with some strike calls. Adrian Gonzalez, who had expressed his displeasure the night before, came back muttering after he struck out, but wouldn’t comment much afterward. The Sox pursued the Rays like it was October, not May, using five relievers to get the final 10 outs. While the team seemed to jell behind an us vs. them (umpires) mentality, the fear in these situations is that a team will earn a reputation for being too vocal, and suffer the consequences of a smaller strike zone. Which is why a couple of Red Sox officials were hoping that the public complaints be kept to a minimum so not to rile the men in blue. 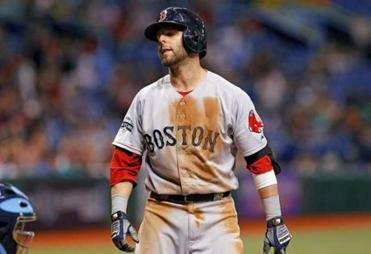 Dustin Pedroia reacted after being called out on strikes against the Tampa Bay Rays on Thursday night. Whether that happened after Gonzalez’s complaints Wednesday is up to interpretation. Thursday night, Aviles was ejected by plate umpire Dan Bellino for arguing a called third strike in the seventh inning. 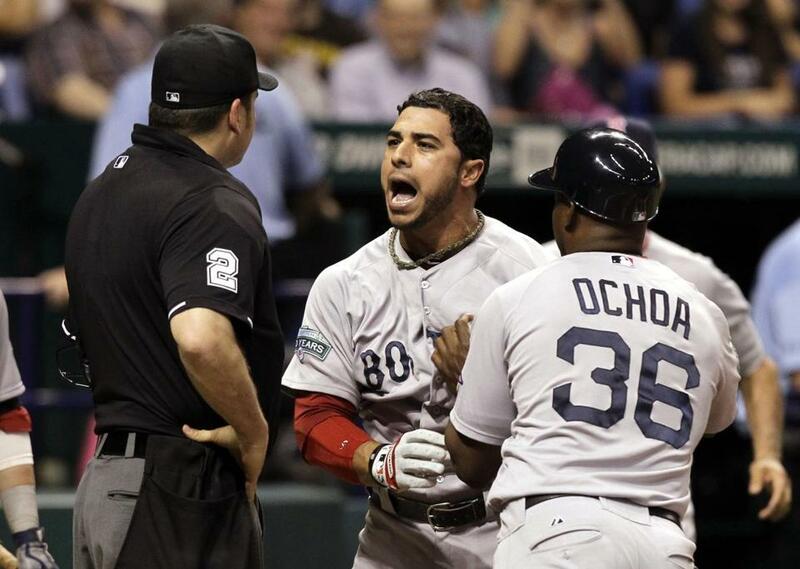 Aviles said it was the first time he’d been ejected as a major leaguer. Gonzalez and Aviles may be right about the strike zone, but to be openly critical of the umpiring does them no favors. Manager Bobby Valentine backed his players. Amid the seriousness was some levity. Gonzalez, who the night before predicted he would hit a home run Thursday night, went 0 for 3, but hit a foul ball with home run distance in the third inning. Gonzalez also got hit by a Matt Moore pitch in the first inning. Some thought it might have been retaliation for Will Rhymes getting plunked by Franklin Morales the night before. Gonzalez’s near home run had the Sox, Gonzalez included, in a playful mood. Gonzalez, who played five seasons in the National League with the Padres, said he was looking forward to playing in Philadelphia this weekend. So, while the last two days were filled with frustration over umpiring and a 2-1 loss Wednesday, some levity returned to the clubhouse. Now they get to go to Philadelphia and see old pal Jonathan Papelbon, who is 11 for 11 this season in save situations. Those words haven’t been uttered in the Red Sox clubhouse for a long time.